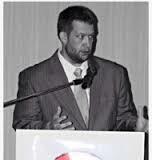 JD Hall’s public confession regarding the Braxton Caner exchange on Twitter. He also gave it to ABP to publish, Pastor repents for interaction with suicidal teen, along with their background article. This is how it looks today. 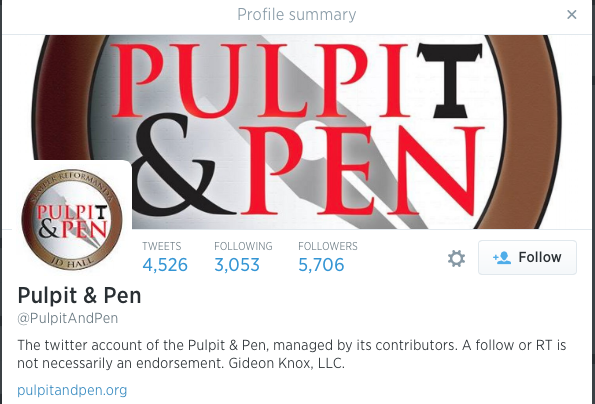 The same Twitter handle is being used, but it seems to reflect that the @PulpitandPen Twitter account might be handled by a group of people, the Pulpit and Pen contributors, I suppose the same group who contribute to the Pulpit and Pen blog. Notice there is no mention of J.D. Hall anywhere, although all the tweets from July 29, 2014 and earlier are from J.D. Hall. The Bible tells us how to handle certain matters when there’s conflict or controversy. We’re not given multiple options for how to handle these things, and thankfully the Scripture lines out clearly how to deal with our differences. We’ve been well-instructed in these matters. As you know, the chief and core mission of this church is to glorify God, and the only proper method of accomplishing that goal is to do things in accordance to Scripture without hesitation or reluctance. So, although it is not part of our usual Lord’s Day routine, we need to deal with a matter in accordance with Scripture for the edification of the body. If you’re here as a guest and not a part of our fellowship, then please understand: We’re doing something churches are supposed to do. After being in this body for a number of years, I began to see corruption, sin, and cover-up in our denomination. I struggled immensely with this, especially in the relationship of our church with the state convention — beginning around 2010. Three years of frustration, disgust, heart-brokenness, and struggle in dealing with these various issues that I believed (and still believe) are a horrible reproach to Christ and his church. All of that struggle came out in a sermon I preached in Helena in 2013 called “Modern Day Downgrade.” Within a few months that sermon had been heard many thousands of times and played on both conventional Christian radio shows and podcasts around the country. It clearly struck a chord. People began to call to see what I thought. They emailed to ask my advice. They began to download my sermons and quote me in their sermons. I was offered help to start and market my own program. People listened to it; many more than I thought would listen. All the while, I was trying to do the work of both a pastor and an evangelist. I say all this because I’ve been fighting a war (a terrible, excruciating war), for about three years. I found myself in a movement calling for reform in the SBC. The next thing I knew people were listening to my concerns. People who shared my concerns listened and encouraged me. Again, there were many more like that than I ever imagined. But that came at a great price. Locally, many may not realize that “JD Hall” became a household name in certain districts of the SBC or that I was often in the middle of skirmishes in faraway lands that most of you couldn’t care less about. Some of you may not even know I had my own radio program. Feedback from me was sometimes solicited by various media outlets around the country. I’ve tried to keep that to a minimum in my life and ministry, albeit without much success. I also realize that this has been my fight. I told you this a number of weeks ago, prior to our celebration of the Lord’s Supper. I realize this has been my fight. The vast majority of you don’t care about the denomination that we are technically affiliated with; most of you weren’t even Baptists before arriving here, and some of you may not even know what denomination we’re in now because we don’t talk about it, and for the most part, we don’t let it affect what we’re trying to accomplish here. So, feeling like this is my fight, I’ve tried to avoid bringing people who are trying to walk with Jesus and live their lives into something that doesn’t pertain to their existence. I realized that I needed to back away from these conflicts through a number of loving brothers who saw the toll this battle was taking on me, my aging, my family, my sanity, my stress. They saw me reveal and speak truth, but sometimes be hard and speak too harshly. I candidly looked around and didn’t recognize what I had become. Simultaneously, about a month ago, I was approached by these friends who said that I should pray about an exit strategy from that part of my life. Its toll was too costly. I was reminded that God says, “Vengeance is mine; I will repay.” And again, “The Lord will judge his people” (Hebrews 10:30). God will settle his own affairs. He doesn’t need me to fix everything that is wrong in the church today. My friends suggested that the over-zealousness of a reckless critic is ultimately no better than error. I believed them, at first reluctantly, but the Spirit led me to agree with them. So, I came before you about seven weeks ago and said that I realized I’ve erred in how have gone about trying to bring about change. That was on Father’s Day, if I recall. I told you I would rebuke myself on account of that. Then, I gave a letter to the church council a few weeks later, suggested to me by no one but my own conscience, and said I would stop writing for my website or for other publications. I haven’t written any articles since then. I said that my radio show was going on hiatus for a few weeks, and might be canceled for good. Some were pressuring me to continue the program and make it more devotional — just do an easy, devotional commentary of Spurgeon’s Morning and Evening. That’s the route that I took. I didn’t completely stop all engagement in these other affairs, but most. I spoke to those hosting my program and told them I was making these changes. But before I took a break from the program, before I stated my conviction that I realign myself and ministry, I had an exchange with the son of Ergun Caner on Twitter. He had displayed various examples of public conduct that to me, at least, was clearly and plainly immoral, and I called him out on it. In regard to this young man’s public behavior, I had made a statement along the lines of, “The immorality surrounding [Ergun Caner] is astounding.” The son engaged me after that, and I asked him one question, and repeated it a second time, concerning a claim his father had made regarding him. I asked him if it were true. The third and last comment I made directly to him was that because of his age, I would discontinue the conversation but that he could email if he felt so led at a later time to seek or speak truth. He then continued to post rather terse comments on Twitter for some time afterward, but I didn’t respond. He didn’t seem terribly torn up over the incident; in fact, he seemed bolder and more defiant in his sin. I received a considerable amount of pushback in the wake of that exchange. A few of my close friends told me that what I did wasn’t a sin, because public sin can and should be addressed publicly and there is, no doubt, Biblical precedent for this. (This is, by the way, why we are addressing this publicly here and now in spite of the abject awkwardness of doing it during our regular Sunday morning worship.) Other friends, though, asked me if my heart was right in calling him out. Could I have done the right thing for the wrong reason, making it the wrong thing? Here’s the conclusion I came to: From to time to time, I see the youth of this church say or convey something that is off track or ungodly. On those occasions I usually contact the mom or dad to say, “Hey. Are you aware of this?” One time I posted the expression “Jesus wept” when a young woman had exhibited profanity on her social media page. But in all those situations, my heart was for the person who needed rebuked. My aim was to reconcile them; to restore them. It was, at its heart, pastoral. Even though this young man’s sin was public, and we didn’t go looking for it (it wasn’t hidden, but laid bare for all the world to see), I confess I called him out for the wrong reason. I posted an apology on my website within just a few days of that exchange. I acknowledged that it was wrong, sinful because my heart was wrong in why I did it, and I asked for forgiveness. I also sent an apology directly to Ergun Caner through a mutual acquaintance, who assured me he would receive it. I told him I was open to apologizing in person if he cared to call me. I also said I was wrong on something else that was gnawing at me but hadn’t received the kind of push-back this other issue did, which is that I gave credence to a rumor I had heard. I apologized for that also and asked forgiveness. It was after this, but not merely because of this, that I decided to make changes in the focus of my wider ministry—especially the radio broadcast. (This was prompted by the godly concern of my friends.) I asked three men to hold me accountable to make sure my radio program was tempered with a new spirit and that my outrage be tempered. The last several weeks after making these changes have been like a vacation. They’ve been nice. I’ve been throwing my newly found spare time into personal evangelism, open air preaching, and even something I haven’t done in years — recreation. I felt back on track and in the Lord’s will. But then nearly a month later, last Tuesday, Ergun Caner’s son committed suicide. I don’t believe my four-comment and rather cordial exchange with him had anything to do with it. (I don’t think any reasonable person would if they knew all the facts.) But frankly, we don’t know for certain what factors led to his suicide, and I’m not sure we ever will. (Apparently, the official cause of death has not yet been determined). But in certain online forums, there was an immediate rush to tie the young man’s suicide to that brief social-media exchange with me more than a month earlier. One prominent commentator from a secular news network was asked by the Caner family to provide commentary within a few days of their son’s death. That writer blamed “cyber bullying” and “thuggery.” Some of the Caner’s associates have accused me of “cyber-stalking”; “harassing”; and “bullying” the young man. People are angry. They want someone to blame. For the last week and a half, I’ve made no attempt to defend myself. The facts are a matter of public record, and even though the whole tragedy pains me deeply, I have made no attempt to erase the record of my exchange with the young man. I wish to be completely transparent. What I don’t want to do and what I refuse to do is minimize my own wrong. It’s true, to my shame, that when I commented publicly about the inconsistencies in the young man’s testimony — and especially when I referenced my concerns about his father — I did not do it in the right spirit or out of the right motivation. It was sinful for me to challenge him publicly like that. I was not thinking or acting pastorally in how I addressed him. I certainly would have treated one of my own flock differently, albeit still directly. My heart leans strongly toward gentleness when dealing similar issues here. And yet when dealing with these issues out there, I have been too hard. I understand why some would say, “Why are you different out there than you are here?” I have been at war for three years. It is hard being both pastor and warrior. They don’t go well together. So I’ve kept them separate. That’s the best explanation I can give. The irony is that about three weeks ago I made known to you, my flock, that I was walking away from these conflicts. It was too late to spare me from the consequences now engulfing me. In one sense, I am reaping what I sowed. When you live by the sword, you die by it . Let me say this in all sincerity: I am profoundly sorry that Braxton Caner ended his life. Knowing now that this young man struggled with that level of despair, I am even more sorry that my interaction with him was adversarial rather than pastoral. News of his death hit me hard, and I was immediately smitten with shame for the lack of grace in my public interaction with him. All the combined invective that has been aimed my way in recent days does not even begin to equal my own grief and contrition. If these events (and my confession) ultimately end any influence I might ever have, I will accept that as our sovereign God’s perfect will. I do realize that God never needed me to right every wrong in the denomination. He can settle his own accounts. His arm is long, both to save and to bring vengeance. In my zeal, there has been a disconnect between my theology and my methodology. I do know God is sovereign— and yet, I’ve relied too much on my own strength and not solely on the Spirit in my earnest desire to see justice prevail. That’s sin, even if the cause is right. I confess it. Let me repeat: I never should have briefly interacted with that young man on the 2nd day of July, because my heart to him was not pastoral. Some have accused me of far worse things. Some seem determined to exploit a tragedy for theological and political gain. That’s wicked. Nor do I wish to elicit anyone’s sympathy. Our prayers must be with the Caner family. Their grief can’t be overstated. And I sincerely grieve with them in their sorrow (Romans 12:15). This is the best display of the Gospel, that I, in all my weakened, broken flesh can demonstrate for you. Right now, it’s all I’ve got. All I can do in the midst of the unbelievable heartache and sadness I feel for the Caner family and my own family and the giant disgrace this mess has become is demonstrate something that we’ve been praying that so many at the heart of this very controversy would do for over four years: repent. To confess sin, to change our minds in repentance toward our erred trajectory, and ask forgiveness for the ways we fall short of the glory of God. Let me assure you of this: This terrible, terrible tragedy has accomplished two things (1) I am broken. I am unequivocally, completely broken. I am a crushed man. My spirit is crushed. I am sorrowful. I am hurting. (2) This has forever changed me, in more ways that I can currently comprehend. With those two realities and everything that accompanies them (the arguments, the warfare, the ridiculous absurdities, sinful failures, fallacious allegations, hysterical reactionaries, capitalizing upon tragedy, and the tragedy itself) the things of the world grow strangely dim, and what seems to burst forth in high-definition clarity is a blood-soaked, rugged cross where all our sin was atoned for. At this point, to me, to this church, to this situation, I think that’s what matters most, and that’s certainly the only source of comfort: a blood-soaked, rugged cross and an empty tomb. We don’t hide things here. We open up. We put it out there. We cling to the promise of Romans 8:1. We want to be real.